Finding an unpolluted night sky is like asking for the moon nowadays, but we’ve rounded up 8 of the best stargazing spots for your next holiday. This breathtaking lodge overlooks an expansive heart-shaped salt pan, giving rise to its name ‘!Xaus’, pronounced ‘kaus’, which means ‘heart’ in the local Nama language. Set amidst endless red dunes in the Kalahari’s Kgalagadi Transfrontier Park near Botswana, !Xaus offers seemingly infinite views of crystal clear, starry night skies. Each of the 12 chalets scattered around !Xaus’ main lodge overlooks a watering hole, frequented by springbok and wildebeest. You may find your bed goes unused as you spend your evenings out here, captivated by the clearly visible Milky Way! As there’s no signal for TV, Wi-Fi, or cell phones at !Xaus, you’ll get a dreamy digital detox far away from daily pressures. As night falls, you’ll understand why the area has so many astral folk stories – under the perennial Southern Cross, Carina, and Centaurus, you’ll feel utterly star-struck. !Xaus is the best dark-sky escape into the desert wild anyone could wish for, as the park it’s in spans a 3,5 million hectare conservation area (almost double Kruger National Park’s size), and is one of the darkest places in the world at night. Quote ‘w&hXausLodge’ when making your reservation to receive a 5% discount on the booking rate. Valid until 31 July 2017; standard T&C’s apply. To book, or call 021 701 7860 ; see their website. Located on a private 5 000 hectare game reserve in the Waterberg, Limpopo, this updated colonial ranch house hasn’t lost its 19th-century allure. Upon entering the main lodge, you’re greeted by a swathe of colourful local fabrics, timber and stone, and the warm traditional feel extends to the six rooms. The lodge can only host up to 12 folks, so there’s always a deck chair at the heated pool, or waterhole viewing spot. Known for its game drives and bush walks, Ant’s Nest also offers activities like mountain biking and wine tasting. The star of the show, though, is the night sky safari (subject to number of participants) – guiding astronomers bring telescopes and astronomical video cameras along, so when watching the live feed of Jupiter’s moons and Saturn’s rings, you won’t miss a single detail. Quote ‘w&hAntsNest’ when making your reservation to receive a 5% discount on the booking rate. Valid until 14 December 2018; standard T&C’s apply. To book, email [email protected] or call 087 820 7233; see their website. One of SA’s ‘blink and you’ll miss it’ gems, Sutherland is best known for its unparalleled starry sights. In fact, it’s been documented that early Khoisan settlers in the area could see Jupiter and its four main moons with their naked eyes. This charming picket-fenced B&B is right on the main road under an endless star-pricked canopy. Here, six double en-suite rooms await. They may be in one of the coldest places in SA, but these homey rooms offer a warm respite – light wooden furniture and neutral colour schemes scream country-style comfort. The rooms have wall-heating panels, but on extra-chilly nights, take advantage of hot-water bottles and electric blankets provided for you. The B&B is just a 20-minute drive from SALT – the Southern African Large Telescope, the largest single optical telescope in the southern hemisphere – so a sky-watching trip should be first on your to-do list. For a more informed session, ask Kambro Kind’s owners to arrange a stargazing excursion at neighbouring Sterland Guest House (from R120pp). By day, take in a new sight on a stroll of Kambro Kind’s farm, enjoying its floral abundance. Quote ‘w&hKambroKind’ when making your reservation to receive a 5% discount on the booking rate. Valid until 10 May 2018; standard T&C’s apply. To book, email [email protected] or call 023 571 1405; see their website. This lodge – 30 minutes away from Mbombela (formerly Nelspruit), in the heart of the Crocodile River Mountain Conservancy – offers the ideal balance between family activities and quiet, private time for reflection. As night falls, expect unforgettable star-observation, too. The Plum Starling four-person family room is your best bet for comfort and convenience. The open-plan room has three beds (don’t worry, parents reserve the queen while the kids are in twins) with a lounge that’s close to the pool. 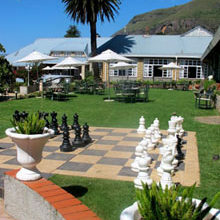 It’s also internally connected to the main lodge, so the restaurant and games room are a few steps away. The country air will have the kids full of life, so after a gourmet breakfast, let them spend the morning outdoors at the pool or farm dam, and trampoline. For an exhilarating family activity, head over to the 70m on-site zip line. 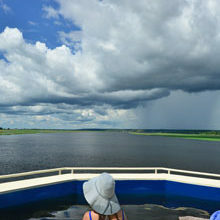 Or leave the adventure to the kids, while you request a knot-releasing massage (from R450pp, minimum two people), or grab a chair on the main deck to spot waterbuck and fish eagles. 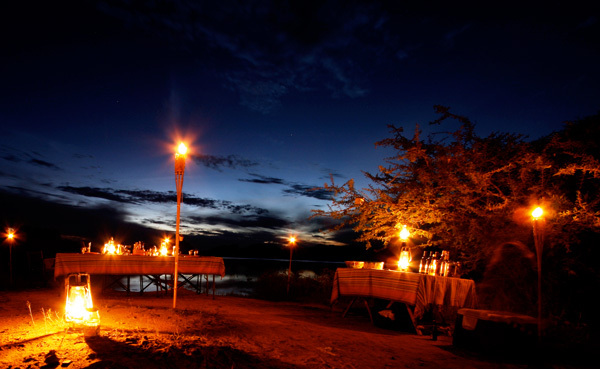 Quote ‘w&hEcoEdenBushLodge’ when making your reservation to receive a complimentary Boma dinner for two. Valid until 31 December 2018; standard T&C’s apply. To book, email [email protected] or call 013 492 1039; see their website. The hospitality centre of the Kagga Kamma Nature Reserve, this lodge is enviably located in a hub of flora and fauna that are almost impossible to come across in other parts of the South African terrain. Book into one of the 10 double Cave Suites, skilfully carved away in the natural sandstone formations – by far one of the most unique rooms you’ll ever stay in! Standing on your private veranda looking over the dusty landscape, with a cave overhead and the world beyond your sight is an experience like no other. Kagga Kamma’s elevation and clear skies make for perfect sky-watching opportunities, but before a captivating night, enjoy a day outside. Start the morning with a guided nature drive around the Karoo-like terrain, and then revel in the area’s abundance of San rock art on the Rock Art Tour. Return to Kagga Kamma for a relaxed afternoon – including, perhaps, a cleansing body wrap (from R550pp) at the spa – and then get ready for a night to remember. At Kagga Kamma’s Mini Observatory, guests will be treated to a stargazing tour (from R150pp) facilitated by a local expert. 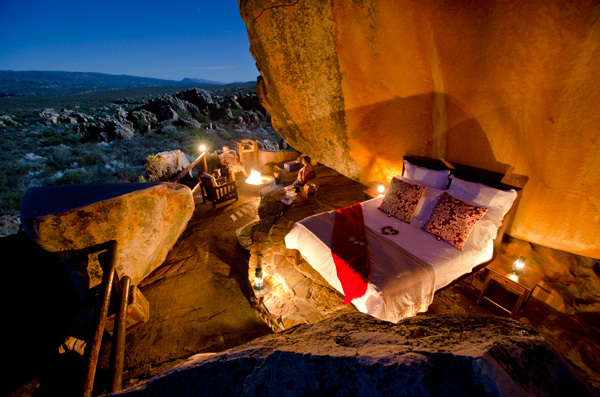 Quote ‘w&hKaggaKamma’ when making your reservation to receive a 15% discount on the booking rate. Valid until 30 April 2018; standard T&C’s apply. 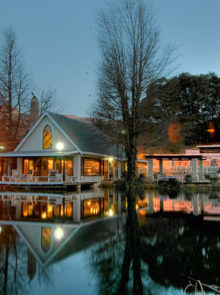 To book, email [email protected] or call 021 872 4343; see their website. 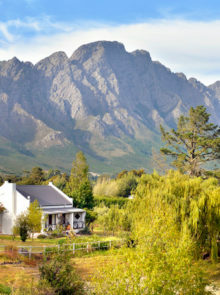 Couples will find heaven in this country guest house, set on a working ostrich farm just outside Oudtshoorn. 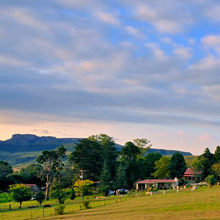 Here, views of the farm, mountains and gardens can only be rivalled by the dustings of stars across the night skies. If privacy is your priority, De Denne’s Garden Suites are key. Opt for the unit nearest the pool, away from the main house – this spacious open-plan room will make you feel like you’re amorously alone in the Karoo. Amenities are just a step away – if it’s warm out, take a dip in the communal pool. Dinner? 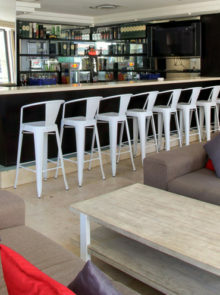 The on-site Ma Belle Restaurant will whip up a delectable dish while you two chat over a glass (or two!) of fine wine. During the day, explore the farm’s walking trails. By night, take up the hour-long guided stargazing experience (R250pp), or try to spot the autumnal Leo constellation from the comfort of your room’s private veranda. Quote ‘w&hDeDenne’ when making your reservation to receive a 10% discount on the booking rate. Valid until 1 September 2018; standard T&C’s apply. To book, call 044 272 7411 or visit their website.